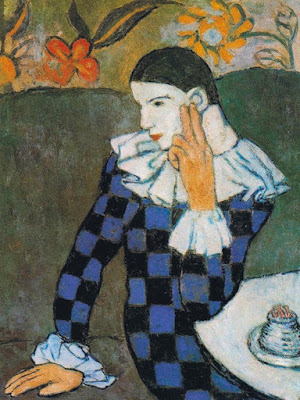 HARLEQUIN, in modern pantomime, the posturing and acrobatic character who gives his name to the “harlequinade,” attired in mask and parti-coloured and spangled tights, and provided with a sword like a bat, by which, himself invisible, he works wonders. It has generally been assumed that Harlequin was transferred to France from the “Arlecchino” of Italian medieval and Renaissance popular comedy; but Dr Driesen in his Ursprung des Harlekins (Berlin, 1904) shows that this is incorrect. An old French “Harlekin” (Herlekin, Hellequin and other variants) is found in folk-literature as early as 1100; he had already become proverbial as a ragamuffin of a demoniacal appearance and character; in 1262 a number of harlekins appear in a play by Adam de la Halle as the intermediaries of King Hellekin, prince of Fairyland, in courting Morgan le Fay; and it was not till much later that the French Harlekin was transformed into the Italian Arlecchino. In his typical French form down to the time of Gottsched, he was a spirit of the air, deriving thence his invisibility and his characteristically light and aery whirlings. Subsequently he returned from the Italian to the French stage, being imported by Marivaux into light comedy; and his various attributes gradually became amalgamated into the latter form taken in pantomime.